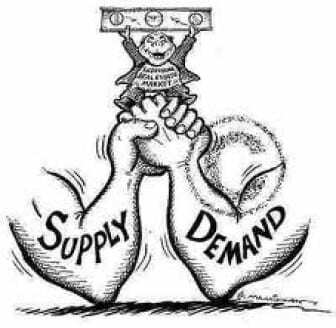 IT’S THE LACK OF DEMAND –STUPID!!! Someone along the way simply inverted the words for pete’s sake. Got it now? Can the rest of America please stop for just a minute and think for yourselves instead of listening to Republicans, banksters, and bobble-heads? Democrats, can you please just stress this simple truth and win this damn election? For Gawd’s sake Democrats, it’s time to stop playing defense–your’re allowing the Republicans, who have screwed up our economy every time they are in power to dictate the conversation–and point out the painfully obvious reason for our economic doldrums. Demand Is the Beginning, Not the End of the Equation. There’s no demand because there’s nobody working. Nobody’s hiring because there’s no demand. There’s no investment because nobody’s working and therefore no demand to expand capacity. Jeez, you’d think this was rocket science. A favorite meme for conservatives is that a large budget deficit is the reason for our stalled economy. Of course they only started saying this after President Obama took over an economy that was in free-fall like a 747 without any fuel-”because of their de-regulatory, go-ahead-and-cheat-it’s-just-business” economic policies. NOW they say austerity and massive spending cuts–except in defense of course. Do we really need to have troops in 70% of the countries on the planet to be safe after all–is that the only way to bring down the deficit? Really? Try selling that to anyone objectively looking at what’s happening in the countries that comprise the Eurozone, the UK, and even China and you’ll probably get hog-tied and roasted for a big picnic. Or try telling any worker in a country that still has an unbiased television media. They’ll have a good laugh at the ignorance. They are all trying Austerity in Europe and it’s failing miserably for every single one of them…including China who has had three quarters of slowing down and massive buildup in inventories–I mean who is left that has any money to buy even their cheap stuff? If Pinocchio were telling the lies above in all their sundry manifestations, Gepetto would have to buy a tree farm to supply enough wood to keep extending his lying puppet’s nose. Many well-known politicians and economists have fueled these fires claiming calamitous consequences unless we get our overwhelming debt under control. Most likely they just want to be elected, so they set their hair on fire,play chicken little, and blame Obama. Don’t misunderstand me. I also strongly believe that it would be unquestionably prudent to address our budget deficit. But the size of our budget deficit IS NOT the reason for any sluggishness in our economy. It just isn’t so. So given what has actually transpired on the way to the predictable REPUBLICAN- fueled fiscal crisis, I will once again plug my One Penny Solution that would not only IMMEDIATELY address the long and short-term deficit problem, it would allow Congress to do their jobs for a change and go about their business of doing, well, whatever the hell it is that they’re supposed to be spending all of my money doing….making life better for all Americans instead of scoring points for their next election cycle. It would also ensure that every single American citizen, visitor, prisoner, criminal, tax-avoider, Cayman-Island tax-evader, and cash-only “entrepreneur” on American soil would be contributing to the debt that has been accumulating since 1835…the last time our national debt stood at $0.00. Second: Automatic increases in unemployment insurance and food stamps, and people starting social security early because they can’t find jobs. Fourth Bush’s TARP, (that didn’t get spent after until Bush left office)and Obama’s Jobs Stimulus, which together account for less than 1/4 of deficit growth, and which paid for themselves in halting the 750,000 PER MONTH jobs being lost at the time Bush left office. The GOP claims that President Obama is the “tax and spend” President, but it was GOP expenditures and de-regulation, combined with the outright thievery by Wall Street that sent the economy over the cliff once already. But the TRUTH is that the last Republican Administration to lower the deficit was RICHARD NIXON. So when the GOP calls President Obama a “tax-and-spend” liberal they are telling an outrageous lie. He’s actually been the biggest TAX-CUTTING LIBERAL in modern times. So when the GOP reduces taxes it’s a”good” thing; when President Obama reduces taxes, these TAX REDUCTIONS are twisted and perverted into extra “spending”. One last GOP meme-busting and I’ll stop. Pay no attention to the warnings that any day now we’ll turn into Greece. Countries like Greece, and for that matter Spain and Italy, are suffering from their short-sighted decisions to give up their own currencies for the fiscal policies and German dream of either conquering southern Europe without military intervention, or Germany’s desire to be a player on the world economic stage with the euro. The only result, however, is that southern European countries are left as the struggling suckers of Germany’s con game and vulnerable in a way that America just isn’t. So Why Then Is the U.S. Economy Struggling? The primary reason is that this is what happens when you have a “deleveraging shock,” in which everyone is trying to pay down debt at the same time. Investors are all dressed up with nowhere to go, nor anywhere to put their money. So they’re buying government debt, even at very low or even NO returns, for lack of alternatives. Even more ironic is that by making money available so cheaply, investors are, in effect begging governments to issue more debt. So, yes, we have a long-term deficit problem, and we should be taking steps to address that problem, mainly by reining in health care costs and broadening the base of individuals who are employed and able to contribute to pay into the coffers rather than take from the coffers(and implementing my One Penny Solution). But the absolute worst thing to be doing is to be laying off schoolteachers, firefighters, and policemen, or canceling infrastructure projects at a time when investors are offering zero- or negative-interest financing. Why the Democrats are unable to make this case to the public is totally beyond me. All you have to do is note that when money is cheap, that’s a good time to invest. And both education and infrastructure are investments in America’s future. England and the rest of Europe are even obliging us with real-time, proof-positive, examples of what will happen to America is we listen to the Republicans and believe that our budget deficit is the most important economic problem and the way to fix that problem is to fire all public employees. The experience of the past few years — above all, the spectacular failure of austerity policies in Europe — has been a dramatic demonstration of the undeniably worst way to fix a struggling economy: how many examples do Americans need to understand that slashing spending in a depressed economy depresses that economy further. So it’s time to stop moaning and groaning about how the Republicans are wrong. Support your Democrats and quit focusing on the party that hijacked our policy discussion and made the deficit the center of conversation. They’ve been wrong about literally everything — and these days even the financial markets are telling us that we should be focused on jobs, growth…AND THAT MEANS DEMAND–NOT SLASHING BUDGETS AT THE ABSOLUTE WORST TIME!!! This entry was posted on July 30th 2012 at 2:55pm/14:55 and is filed under Live News Column 1, Politics. You can follow any responses to this entry through the RSS 2.0 feed.